Seen above is a photo of our group eating lunch at one of my favorite restaurants, Davanza's, right off of Main Street in Park City. Clockwise from bottom left is Sean, Scott (from WeAreMovieGeeks.com), Neil (from FSR), Peter (from /Film), Tristan, and our own Bob Stencil. Sundance officially kicked off today with the opening night film Mary and Max and before we caught that screening in the evening, we made our annual trek to Davanza's. It was literally the first place I went three years ago the moment I arrived in Park City for my first Sundance and obviously I haven't ever forgotten about it since then. Great place. But let's get down to business -- Sundance is about the films, not where (and who) I'm eating lunch with! Unfortunately, this being the first night of Sundance, there was only one film to see. I'll get to that in a bit, but before I do, I need to mention how much I love seeing Sundance grow every year. Not in size, but with improvements. Every year they take those tiny nuisances that we complain about and improve upon them ever so slightly. It may be a different procedure this year for getting into our press screenings, but the tent we that all have to wait in is nice and warm, so I don't mind. Little things make the difference. Now on to Mary and Max. The film is a claymation animation feature from Australia. The story follows one young eight-year-old girl in Australia who randomly picks an even weirder man in New York City to become pen pals with. The entire film is told through the letters these two write to each other, but it's not as simple as that. The whole world and the characters and visuals are all almost surreal because it's so quirky and eccentric. Neither the young girl nor the man have any friends and so it becomes a story about their lives as shaped by their odd friendship. While I thought it was definitely a good film, I wouldn't call it great. 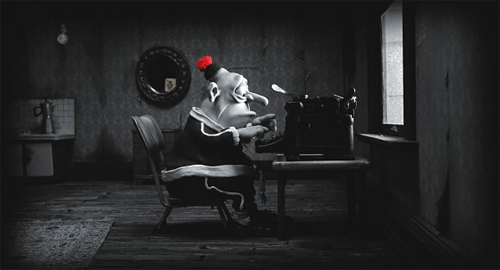 There is a lot to like about Mary and Max, including its wonderful music, its gorgeous claymation animation, and probably most of all, the voices provided by the likes of Philip Seymour Hoffman and Toni Collette. Throughout the film I never could even tell it was Hoffman doing the voice, but ultimately, it was his voice that made that character so dynamic and fascinating to watch. But as for the overall film itself, my biggest problem was that it just felt too indie to be anything to fall in love with. Meaning, although I'd suggest it, it's not a film I ever plan on watching again, and was simply an entertaining one-off experience. I will say, however, that Sundance chose the perfect film to kick off this year's festival. Don't get me wrong, I didn't dislike Mary and Max as much as it may sound. And more than anything, I'm so glad that this was the film that I kicked of the 2009 Sundance Film Festival with. It has left me in such a great mood, despite many considerably depressing occurrences within it, most likely because it just had that perfect Sundance feeling to it and I can't wait to get into the thick of things tomorrow. Speaking of which, it's about time I catch some sleep, because my morning screening of Tyson is at 8:30AM. Until tomorrow! Huh. Sounds like the movie is something I would really enjoy, because I like the odd and the quirky. But to each his own. Looking forward to the next post! Nice! I'm excited to hear more stuff! Also, there are 9 short films from Sundance on iTunes that are free to download! Grab them if you're at all interested. I just saw this film last night at Sundance in Ogden. The best part of the whole movie was the detail they went into making it. I don't know that it will find a large audience, but it was well done.